Since Tangerine, the first full feature film shot on iPhone 5S and an $8 video camera app, premiered at Sundance a couple of years ago, it has become evident that iPhone videos and photos have a bright future. Even though iPhone's built-in cameras are capable of producing stunning image quality until Apple finds a way to add a much larger sensor to their phones the difference between photos taken with a DSLR and an iPhone will be obvious. Using some of many available camera apps can help photographers and videographers alike to overcome some of the limits presented by the Apple's phone cameras. Simply put, camera apps allow you to have full control over the picture taking process. In this article, we are going to guide you through some of the best photo and video camera apps for iOS on the market today. Only two years after the app's initial release, Apple announced in May 2012 that Camera+ was the 10th most popular paid app of all times among all iPhone users. Since then most of the leading authorities on the subject described it as a must have app that serves as more than a capable alternative to the standard iOS camera app. Camera+ is available at the App store for just $2.99 and more than 10 million users downloaded it. The features such as image stabilizer that automatically takes a shot when your device is most stable or 6X optical zoom, enable the Camera+ users to take near perfect shots. 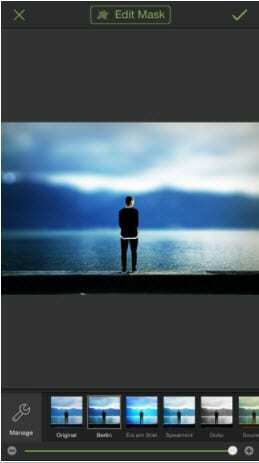 In addition, the app offers a plethora of photo filters and image editing tools. However, the app doesn't allow you to see the effect of the filter you wish to use before taking a photo, but despite that, it is still a must own app. If you are taking photos on your DSLR or phone there is no way that you are going to get the best results if you are constantly using the auto programs. ProCam 4 allows you to take full manual control of your iPhone camera. Setting the right exposure time or finding the focal point of your images manually can make all the difference between a bad and a breathtaking photo. The app costs just $4.99 and at 45.1 MB it is relatively small in size. It requires iOS 9.0 or later and it can be used with an iPad, iPhone or iPad touch. ProCam 4 allows you to save your photos in both JPEG and RAW files, which enables you to approach the editing process more seriously. If you want to edit your images with ProCam 4 you might experience some difficulty while trying to process images in high resolution. This app for iOS doesn't need a special introduction to most of iPhone users out there. It is one of the most frequently used camera apps in the world. 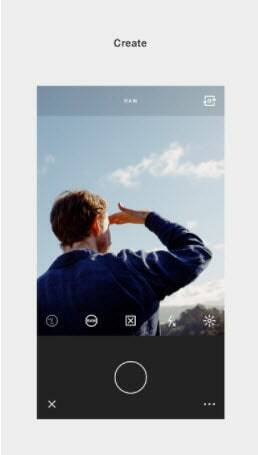 It became famous for its unique film-like filters, but VSCO Cam also offers outstanding features that help users create better images. One of the apps' most beneficial properties is the grid that offers assistance to anyone who is struggling with the composition of images. VSCO Cam is free to download, but using it properly requires some previous knowledge about photography in general. The free version of the app allows you to choose between just 10 photographic filters, but the full filter package costs only $6. Despite all the available filters for VSCO Cam the app still lacks some of the more hip and unconventional filters. The app's interface is easy to use and it includes numerous essential photo editing options such as Contrast, Sharpen, Saturation, Exposure and much more. This app can be downloaded for free at the app store and it is available in more than twenty languages. This is easy to use software for iOS that aids its users in both picture-taking and editing processes. Taking a photo with TADAA is not complicated, you just start the app and snap a photo or photos because the app allows you take a series of photos with the RapidCapture tool. Controlling the depth of field is one of the greatest advantages the app has to offer because masking an area or objects and making them look sharp is almost effortless. The app requires iOS 6.0 or later in order to function properly on iPhones or iPads. 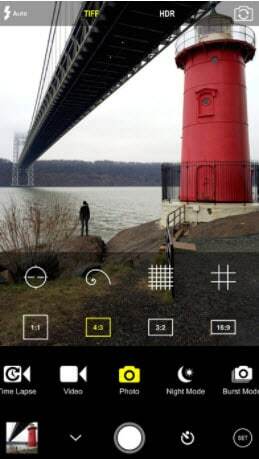 Overall TADAA is a solid camera app that has all the necessary features that are essential to great photography. Most iPhones and digital cameras do all the light measuring or focusing for you, but more experienced photographers know that automatic digital camera programs can be unreliable. The Manual camera app for iOS gives the user the full control of the picture-taking process and permits you to take a photo with your iPhone in the same way a professional photographer would. The app can save the photos you take in JPEG or RAW formats, which is excellent news for users who want to edit the pictures they've taken. However, it can happen that some apps don't support DNG format RAW files the Manual app is creating and these apps can only show the low-resolution preview of the photo. You can download the Manual camera app for $3.99 at the App Store. 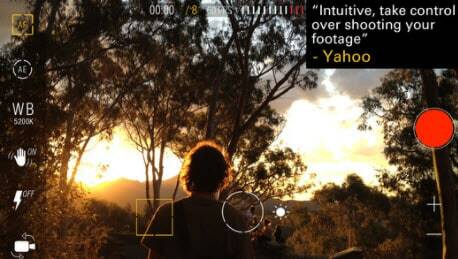 With more than 3 million users ProCamera is sort of a standard for iPhone photography. The app's easy to use interface is equally attractive to beginners and more experienced users. ProCamera has a proven record of performance in low light conditions. This fact alone places it among best camera apps you can find. The app allows you to choose between different capture formats, such as Golden Ratio, 4:3 or 16:9. You can also use ProCamera to create HD and 4K video. With more than 80 different filters and numerous image editing tools it is safe to say that ProCamera app, that is available at the app store for just $4.99, is among the best post processing apps the money can buy. 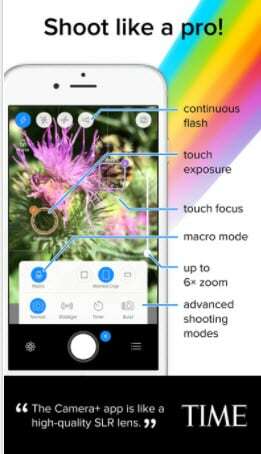 Although the ProCamera app allows you to use manual focus this feature is still in the development phase and can be somewhat difficult to use. If you are looking for a powerful app for recording video of the highest quality, look no further. MoviePro is a powerhouse that enables iPhone 6 and 7 users to shoot 4K videos with their phones. It costs only $5.99 and it is probably one of the best investments you can make if you are looking for an app that enables you to adjust video quality and save space. You can record footage in landscape and portrait modes, select between wide, tele and dual lenses and edit the video with all sorts of editing tools. The footage you capture with MoviePro can be easily shared on Facebook and other social networks. This an app that will allow you to make professional videos, but it is not best suited for users who are just getting acquainted with video creation process. The ProShot camera app can be used for photography and video purposes with the same amount of effectiveness. The users who would like to take photos with this app can choose between Auto, Manual and Program modes and regardless of which of these programs you are using you can save your files in RAW format. Video features include 4K Video, 4K Timelapse, adjustable frame rate and resolution, capture still frames while recording, to mention just a few. The app can be purchased for $3.99 and it requires iOS 9.0 or later to function. The abundance of choices this app offers is what makes it difficult to use, and most inexperienced users should stick to Auto mode because it is very easy to overexpose your pictures or video footage in the manual mode. 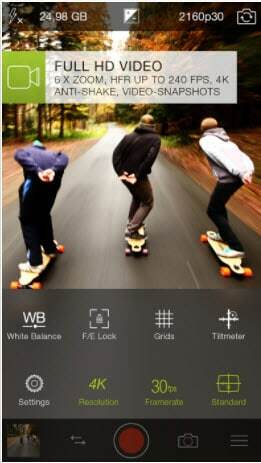 This camera app contains all the pro-level video features, just more simplified and easier to use. At just $3.99 the iPhone users, can buy an app that enables them to shoot 4K videos, set ISO values or shutter speed manually or monitor the audio levels while recording. Besides amazing video properties, Kinomatic allows you to freely edit and trim your video clips. 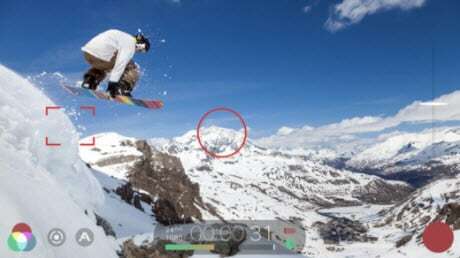 The app can capture video at high and low frame rates, and it allows you to pull focus manually. 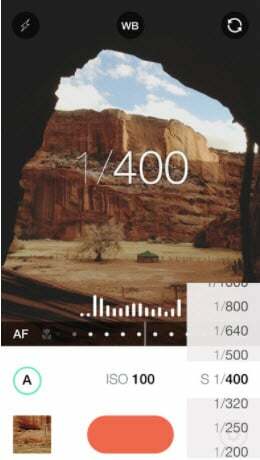 Kinomatic lets you adjust the resolution at which the video is captured. The app is suitable for professional broadcast and filming, which speaks volumes about its capacities, but using Kinomatic might prove difficult to someone with only basic knowledge of video recording and editing software. If you want to approach filming with your iPhone seriously, this is a must have an app that will take you one step closer to producing the video footage of the highest standard from your phone. FiLMiC Pro received many prestigious awards over the course of the years, including Best Video Camera app from the Best App Ever Awards. You can purchase it at the App Store for $14.99, which might seem pricey given the fact that there are plenty of remarkable camera apps on the market. The seemingly high price can be justified by the user-friendly interface that can be adjusted to meet the needs of users of all experience levels. 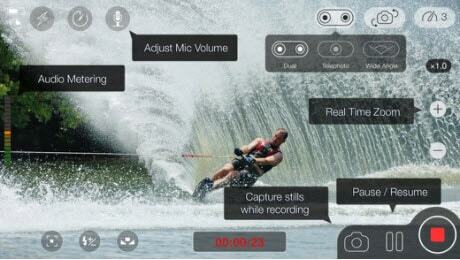 FiLMiC Pro is a pocket-sized studio that will enable you to record and edit footage with your iPhone.